The g-Pet Plus is a species specific veterinary glucometer. 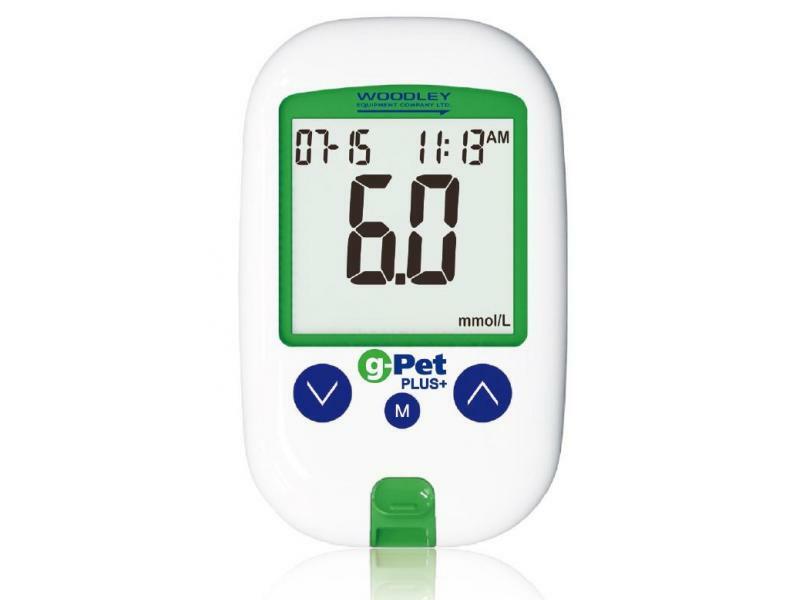 g-Pet Plus is easy to use and economical meaning that its suitable for use by veterinarians as well as owners of diabetic pets who have undergone a brief period of training from their vets. As a handheld device it can be used in-practice, in the field or at home as a portable meter of blood glucose levels in cats, dogs and horses. The g-Pet Plus blood glucose meter has a memory capable of storing 500 results and a large LCD display. A sample of only 0.7µl is required to produce highly accurate glucose results within 5 seconds. The g-Pet Plus Veterinary Glucometer is a useful device for monitoring animal diabetes. As a handheld meter it is able to be used at home, in a practice or in the field. 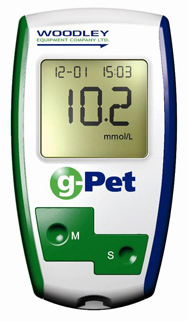 g-Pet Plus provides an excellent way of regularly checking glucose blood levels in diabetic dogs and cats. The g-Pet Plus Veterinary Glucometer is useful for any vet practice or diabetic pet owner. A 0.7μl sample of venous or capillary blood is required for analysis; an in-built confirmation window can show the user whether the sample is of sufficient volume before the test goes ahead. The alarm notification system enables the user to set regular reminders for testing. This is a useful feature when monitoring dog diabetes and cat diabetes. Why use the gPet PLUS veterinary glucose meter rather than a human glucose meter? Human glucometers are not always accurate when measuring glucose levels in animals. This is because red blood cell size and the distribution of glucose within the blood differs from species to species. A proportion of glucose is contained within the red blood cells and the remainder in the surrounding plasma. Humans have a higher haematocrit compared to cats, dogs and horses, as well as larger red blood cells. Therefore, the distribution of glucose within plasma is proportionally much lower in humans compared to these animals, as a larger portion of glucose is contained within the red blood cells. Subsequently, these differences in glucose distribution have a bearing on the glucose result when testing animals with a meter designed for human use, as false results are reported in some instances. 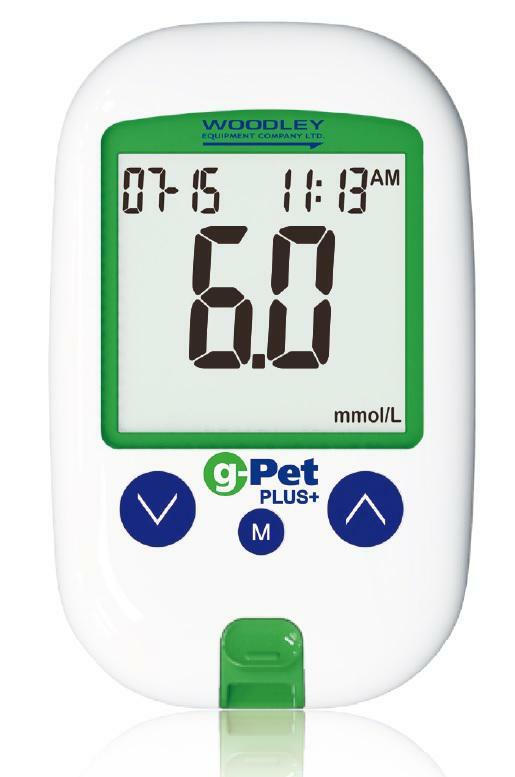 The gPet PLUS veterinary glucose meter is calibrated specifically for use in cats, dogs and horses. Each gPet PLUS meter contain all relevant calibration information to ensure an accurate result is reported for each species. Vets no longer need to persist with inaccurate human meters as there is now a low cost, veterinary specific alternative. Below are some recent questions we've received regarding G-Pet Veterinary Glucometer Plus, including answers from our team. This is readable in mmol/l or mg/dl. Why do the test strips cost more than the whole kit? I'm better off getting a new kit than a pack of test strips. Is this right? This is a very odd situation but we have verified the prices with our wholesaler. Our prices are a correct reflection of the prices we are charged. It makes no logical sense and I think it is ridiculous, but there it is.